Earlier today I posted about my packing organization, but this post is a focus on tips to consolidate space, stay healthy and more! I don’t use too much lotion or aloe while I’m traveling, but it’s nice to have it just in case. 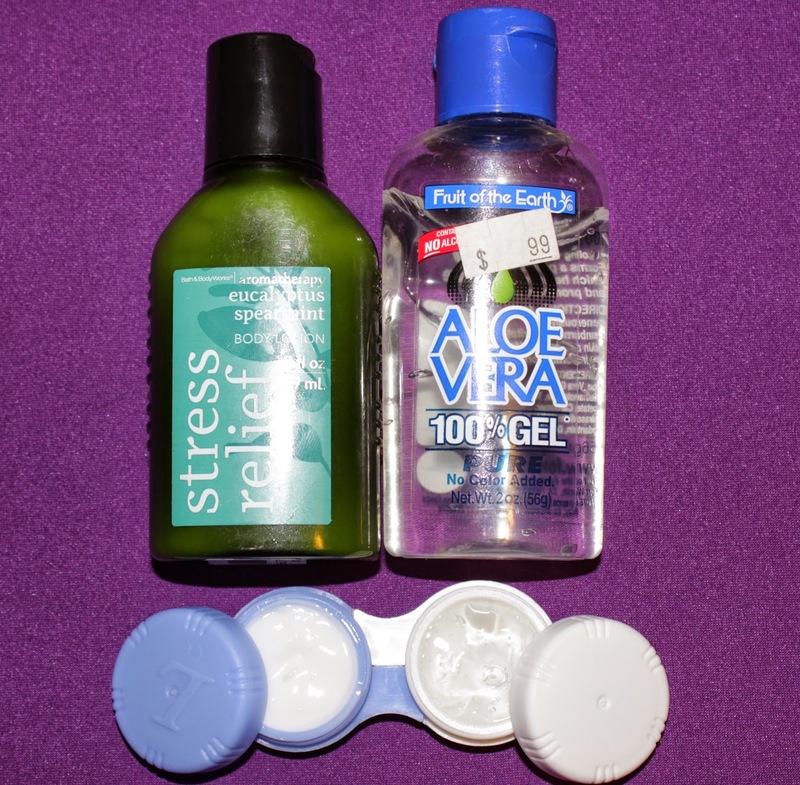 A contact lens case saves me from carrying two travel-sized bottles around that I’ll barely use. NOTE: If you use contact lenses, mark your actual case quite clearly! 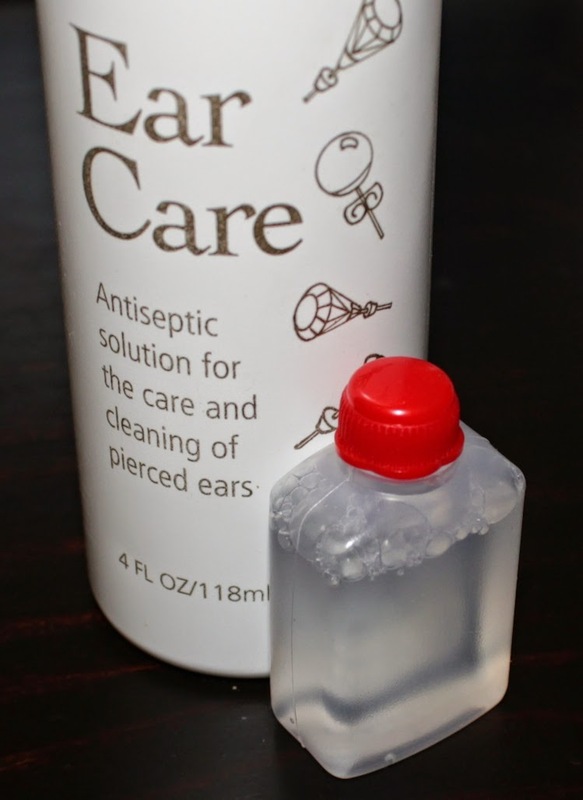 Like the lotion above, sometimes I may need a small amount of ear care antiseptic or other very liquid-y products. Soy sauce bento containers (link) are designed to hold liquids (I normally use them for vinaigrette in hubby’s lunches), just make sure you clearly mark them so you don’t use them for food! 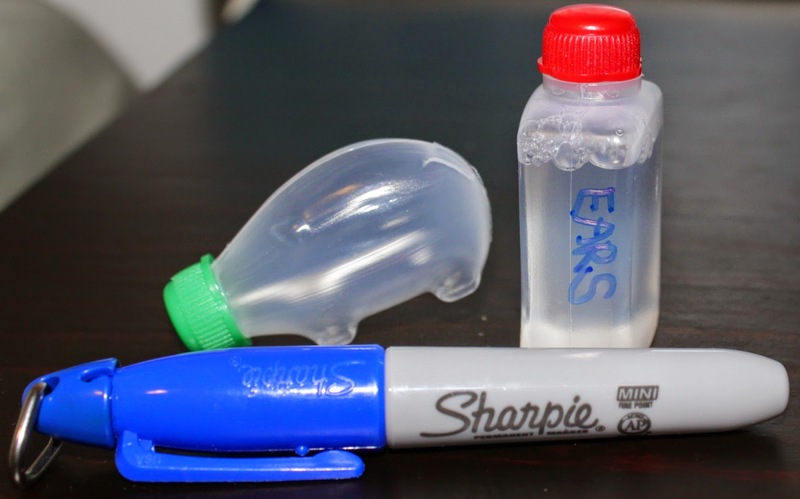 Sharpie makes mini permanent markers (link). Any time I’ve not taken one I’ve regretted not having it on-hand. Trust me, it’s bound to be useful at some point and doesn’t take up space. I’m not a perfume person, but I like to use some body spray (especially in hotel bathrooms… it’s not like they give you a deodorizing spray in those, and we all have human functions). This Travalo refillable perfume spray bottle (link, $6-12 at Kohl’s) is tiny but holds more than enough spray for your travel, unless you love to bathe yourself in it. I picked up two at 50% off at Kohl’s just so I could have both vanilla and strawberry scents with me. At home I use a WaterPik, but when I’m traveling I like to take dental flossers with me. 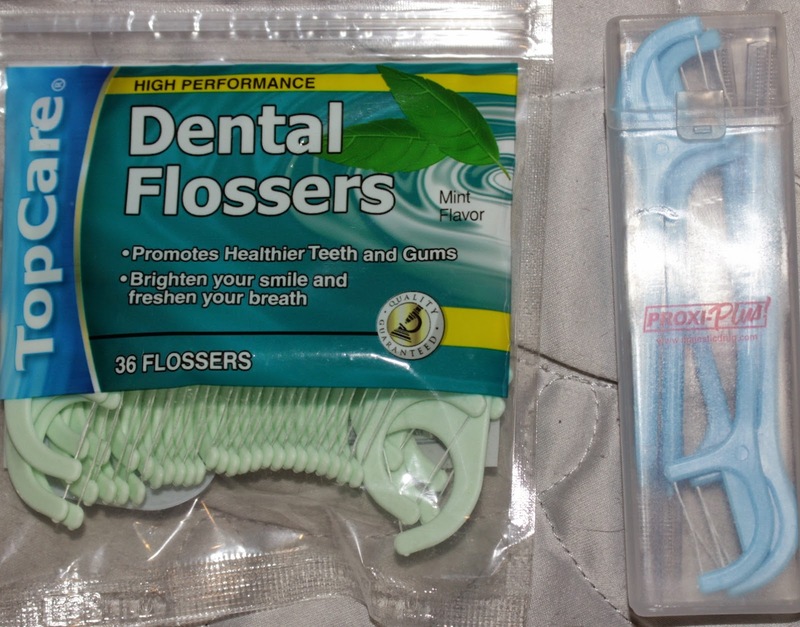 Normally I tote around a full flosser bag (above, left) but a few weeks ago I saw a Proxi-Plus flosser kit on clearance at Walgreens (similar), so that will be my new compact travel kit for flossing. Taking the whole bag or using a snack baggie works just fine, too, though! While pill boxes won’t fit larger pieces of jewelry, most standard earrings and rings, as well as smaller bracelets and necklaces, will fit into them. Not only does this make it easy for being on-the-go but it also staves off the inevitable tangling that usually follows travel. For larger jewelry, I use a small beading pouch I got from Michaels several years ago (pictured below). It zips up into a nice oval! If you’re anything like me, you probably end up picking up goodies to take back home to loved ones–in my case, three kids and a husband. 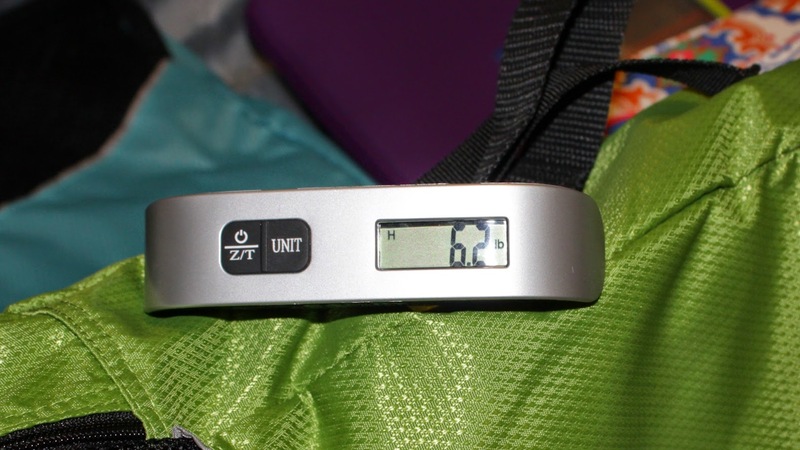 This little hand-held scale (link) weighs only 3 ozs itself but can measure weight up to 110 lbs; frankly if your bag weighs more than that, I’m very scared for you. 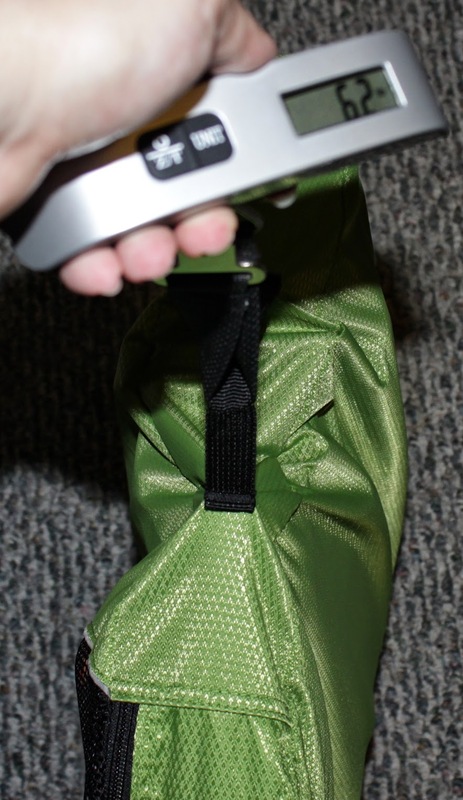 To weigh the bag (can use on luggage but I just did it on a stuffed packing cube since I was holding the camera in one hand and scale in the other) you wrap the scale’s strap around the bag’s handle, make sure it’s zeroed out and lift until it registers the weight. This sucker saved me from going over the check-in limit coming back from LA in June (I hit 50 lbs exactly)! You can toggle the unit of measurement to kg if you prefer that instead. Sometimes everything goes wonderfully while traveling, and other times you drop a spaghetti noodle on your white shirt. Tide-to-Go sticks (link) are awesome for these moments. Honestly, I’m not 100% sure they’d save tomato sauce on a white shirt, but I have used them for other general laundry purposes. Who hasn’t gotten to their destination and had wrinkled clothing no matter how you tried to pack it? I bought the Downy Wrinkle Releaser (link) completely expecting it to not work. IT WORKS, holy cow, it works beautifully. I 10000% recommend getting one, but if you do, I also recommend using it as soon as you get into your room and unpack. The scent is strong at first, so get it over with and hang up your clothes, and they’ll be perfect and ready for you that evening or the next day. 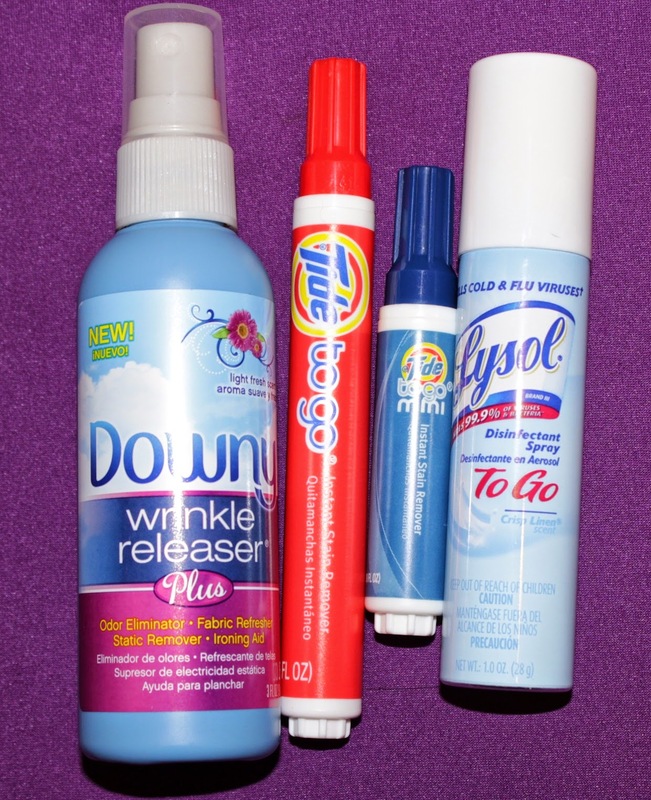 The Lysol-to-Go spray (link) is just great to have nearby for any disinfecting needs! All three of those items should be easy to find in the travel supply section of your local drugstore. 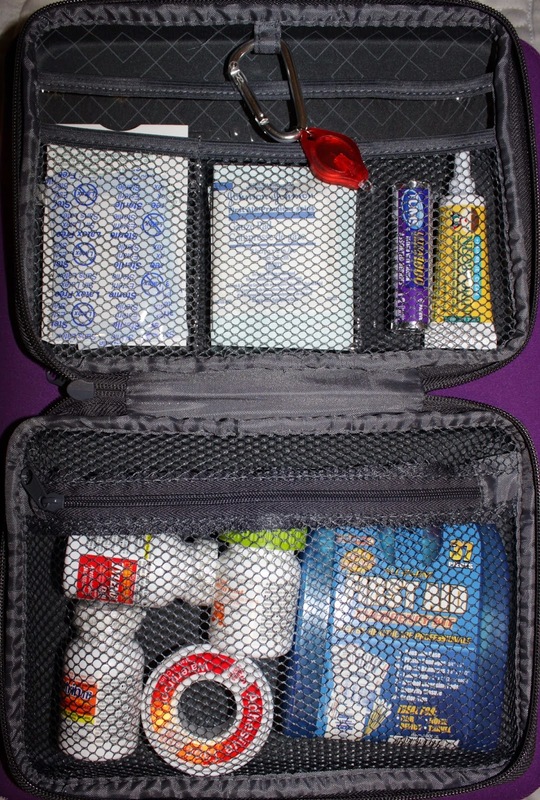 I know this pictured first aid kit (similar) is a bit larger than the normal person needs (in general, the standard little blue kit you can see inside my bigger kit would be fine) but after having way too many foot problems this year and a recent procedure with after-care needed this month, I decided to be a bit more prepared. I can fit in bandaids (inside the smaller blue kit), tyenol/motrin/allergy pills, antibiotic cream, cloth tape, gauze, etc. 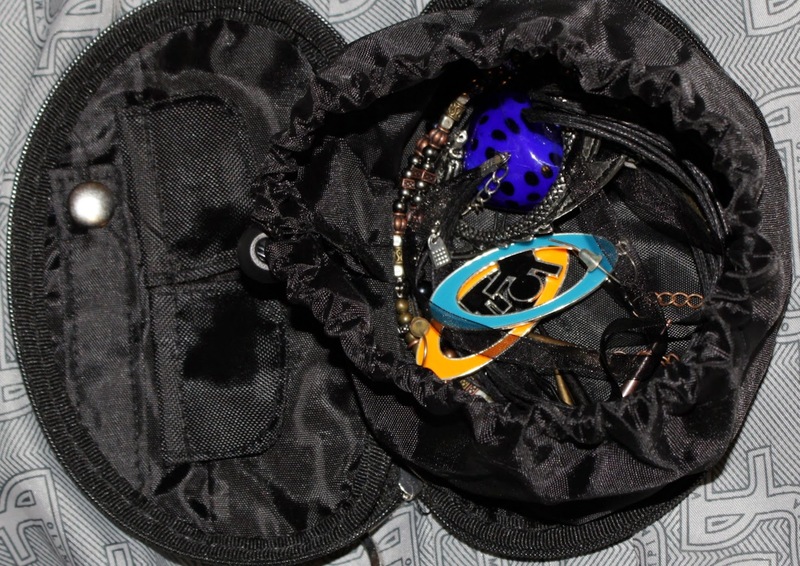 The case zips closed easily (below) and is still light and easy enough to pack up. 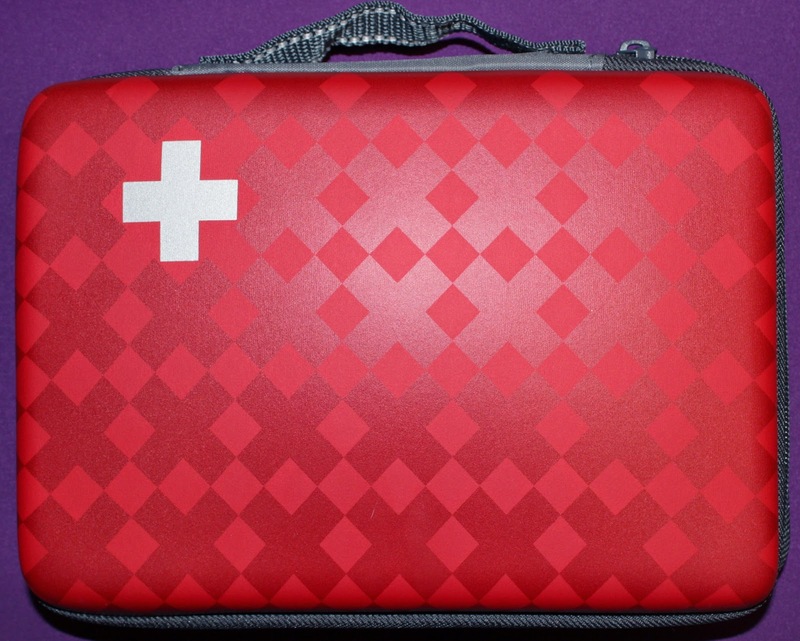 The case I got for free from Target with the purchase of three first-aid related items (gauze, band-aids and cloth tape, oh my! ), and I’ve seen similar deals in my local Walgreens. 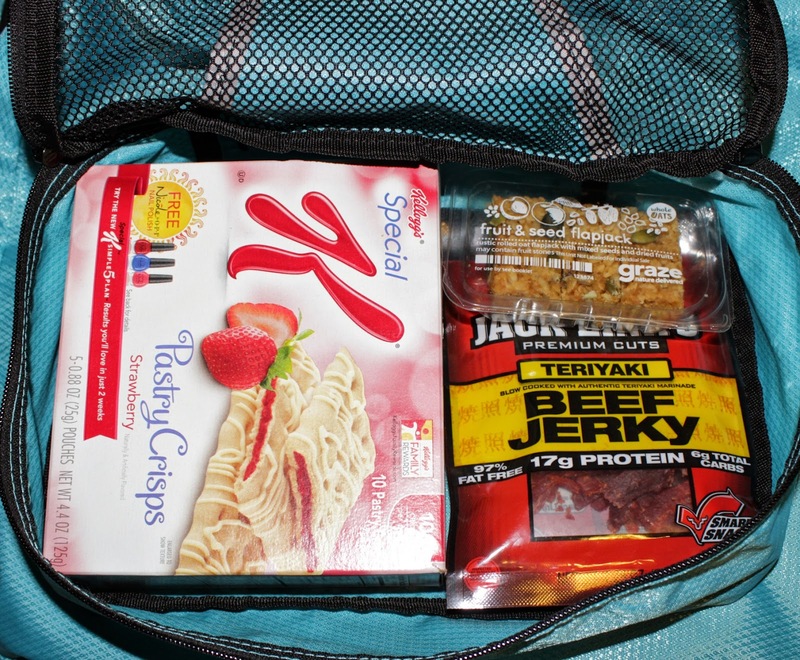 After my first convention I learned an important lesson: bring snacks! I do this now for any trip I take. If I don’t have time for a full meal, I have a bigger bag (above) to graze from while stopping by the hotel room. When I’m on the go (on a plane, in the airport, sitting around in panels, etc) I carry a smaller bag about the length of my hand (below) with just a few snacks in it. 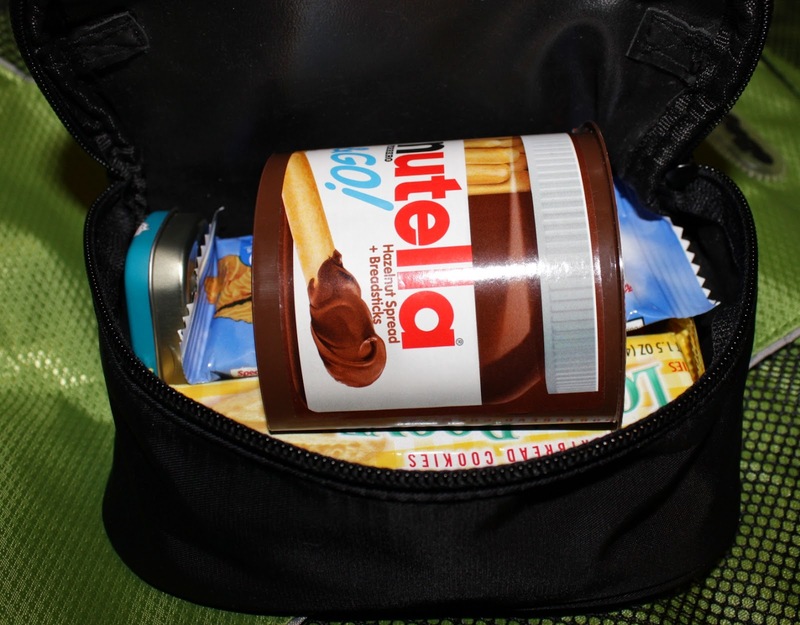 It stuffs into a walking bag easily and it’s much better than passing out from lack of caloric intake. 11. Everything else not pictured! Remember spare batteries and/or charge cables. Remember the wall outlet plugs for them. These cables are not cheap to replace, especially in tourist-y towns. Any bag would do, but I personally like my AmazonBasics travel case for throwing most of my electronics accessories, digital recorder, extra business cards and memory cards, and my USB drives in. Not applicable for everyone, but maybe for you: remember your USB flash drive! If you’re going to record video or many photos, pack your tripod! If you’re doing a lot of walking, or skipping full meals, carry around a water bottle with you. This goes along with having some snacks on-hand. It’s very easy to dehydrate yourself because you get so occupied with what you’re doing during your travel, so don’t let this happen to you. Pack some breath mints. You may not have time to brush your teeth or use mouthwash after a meal and this can avoid an embarrassing situation. I personally like wintergreen Altoids Smalls, which can commonly be found at grocery stores. Easy to carry in a bag or your pocket. Remember to bring some earbuds for the plane. I hate earbuds but I finally found a nice pair that fits my smaller ears: JLab JBuds Hi-Fi. In a pinch headphones work too, but take up more space. Taking liquids on a carry-on? Remember that TSA requires that they’re 3 oz or less, and have them all in a clear zip-lock bag so you can pull it out quickly before sending it through the x-ray. If you are checking a bag, it’s just easier on everyone to put your liquids in that. Ladies: Even if it’s not that time of the month, take a bit of feminine products with you just in case. I like to use an empty travel q-tip container ($1 in store travel sections) to hold three compact tampons. Even if you don’t end up needing it, you never know when you might run into another woman who does! Travel pillows are awesome. I thought they were goofy for the longest time, but finally decided to try a memory foam pillow that rolls up fairly compactly. It was twice as useful when the hotel I stayed at had horribly uncomfortable pillows so I used it while sleeping, too. Have one pair of extra underwear and socks in your carry-on. I ended up with a canceled flight resulting in an overnight stay coming home during winter earlier this year (thanks, O’Hare). While I was lucky enough to have a spare pair of undies, I wasn’t so lucky with the socks.. and I’m very, very picky about wearing fresh socks every day. Since then I’ve picked up this 4-pack of mesh bags, and use the largest black one for a shirt/undies/socks in my carry-on. The others are various sizes handy for all kinds of smaller items (pens, travel brush, charging cord+plug, powder, hair ties, etc) that are no longer flying around loose in my carry-on bag. If you’re going to Vegas and grab a taxi out of the airport to head to a hotel on the strip, inform the driver to not take the freeway. This isn’t a packing tip, but trust me, it will save you money avoiding it. That’s about all I got. If you’re heading to SOE Live 2014 I’ll see you Wednesday afternoon! 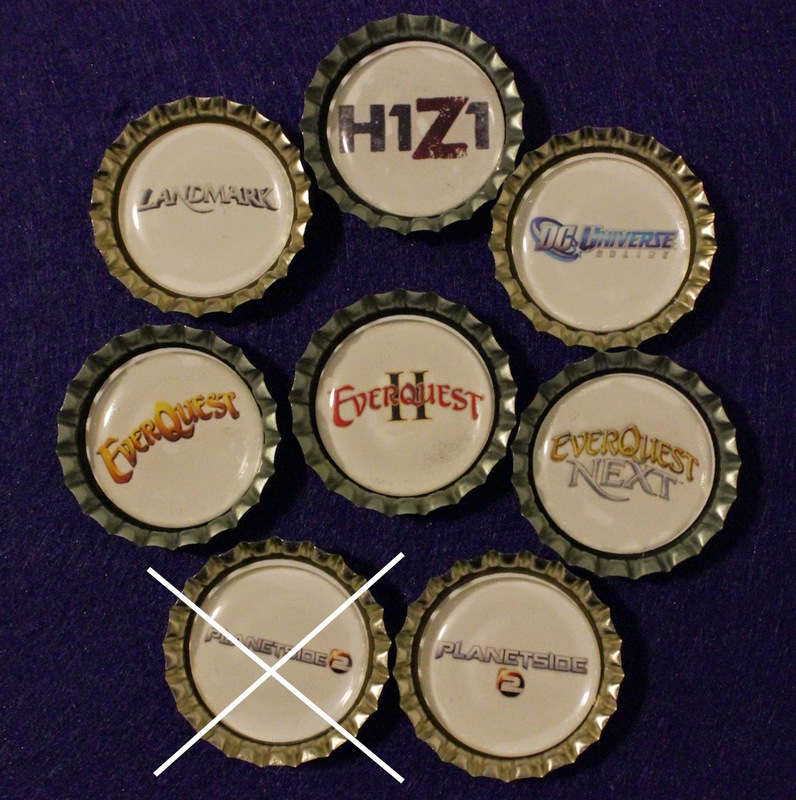 If you want a geek badge (pictured below; right-side PlanetSide 2 badge variation only, and there’s a Dragon’s Prophet one not pictured) at the event this year, shoot me a mention @Cyliena on Twitter with your badge name/game(s) you want them for and I’ll try to reserve it for you.